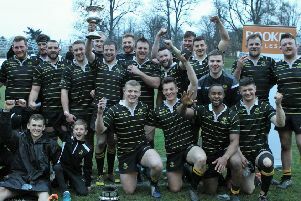 Selkirk were officially relegated from the Premiership after losing 15-33 to Glasgow Hawks at Philiphaugh, but the Souters went down fighting, scoring two excellent tries against their powerhouse opponents. Hawks, fielding the heaviest forward pack in the Premiership, used their power up front to score two first-half tries, the first a penalty try and the second a pushover score from a scrum five metres out, credited to No.8 Andy Hill. The penalty try also resulted in the sin-binning of Selkirk’s loosehead prop Grant Shiels, an idiotic refereeing decision that made an already overpowered Selkirk pack even weaker and the game less competitive. The visitors’ other first-half try was also scored by Hill and again from close range. Former Gala player Gregor Hunter converted two of Hawks’ first-half scores for a 19-3 interval advantage, Selkirk’s points having come from a penalty goal by scrum half Nathan Fowles. Playing against the stiff breeze blowing end to end, Hawks extended their lead with a try created by Hunter and finished by wing Ker Gossman, Hunter’s conversion making the score 26-3 for the Glasgow men. Selkirk then showed their determination to play rugby with a superb try by centre Ross Nixon from good use of the ball, Fowles adding the conversion. Then, minutes later, Selkirk struck again with an impressive try by full back Josh Welsh from a finely-judged grubber kick by fly half Dashton Wellman. But Hawks reasserted themselves and again used the force of their beefy forwards to engineer a try for replacement Grant Stewart, centre Jack Steele adding the conversion to complete the scoring.